Wow! That's exactly what I thought when I finished reading Mayflower, the first book in debut author Linda Smigaj's Fly on the Wall series. This was simply a fantastic read; fun, adventurous and rooted in history with quite an interesting protagonist, a cheese fly named Anna. Anna has traveled to England with a family fleeing Holland, and then she takes the Mayflower to the New World. With lots of historically accurate illustrations showing how the ship was organized, as well as facts and information presented in an absolutely wonderful way, this book will keep children entertained as they are being educated...a dream for any parent or teacher for sure! I so, so enjoyed Mayflower. Author Linda Smigaj has done a completely wonderful job in writing an engaging and delightful story with a great deal of educational merit. Her use of a fly as the narrator is both surprising and delightful - the old saying of "I wish I could be a fly on the wall..." comes true in this book! This book does an excellent job in relaying true life facts and experiences about the Mayflower and those who journeyed to the New World on her, but does so in such a way that kids might not even know that they are being educated, they'll be having too much fun. I highly recommend Mayflower to any child looking for a good book, or parent for a unique book that their child will love. I look forward to reading more from Linda Smigaj's entertaining new Fly on the Wall series, and hope that the author is already hard at work on the next installment! Linda Smigaj's educational book for children, Mayflower: Fly on the Wall, is filled with fascinating and little-known historical facts that make this Fly on the Wall book a particularly interesting read for both children and adults. Anna's narrative is beautifully brought to life by the pen and ink and watercolor illustrations of Mark W. Adams. I instantly knew I was in for a treat when I opened the book to the illustrations showing the parts of the ship and the areas where the Pilgrims and the other passengers spent their time aboard the Mayflower. And while I was fully aware that I was reading an historical and educational book, it felt more as if I were reading an adventure tale, and an exhilarating one at that. What a marvelous way to introduce history to young readers! This very entertaining and informative work also contains a glossary and an appendix filled with more little known facts about the Mayflower's journey. Mayflower: Fly on the Wall is most highly recommended. Mayflower (Fly on the Wall Series) is written by Linda Smigaj. This 50-page fiction book written for 7-10-year-olds by a retired elementary school teacher of 34 years conveys a powerful lesson. The main characters are Professor Beatrice Fuddy-Duddy and Anna, a cheese fly. The story dates back 400 years, starting in the year 1620 to chronicle the arrival of a ship called the Mayflower. Anna is a cute little character dressed in a stunning, colorful outfit; she wears a bow tie and displays colorful wings. The book contains journal entries about what transpires on the ship as seen through the eyes of a fly. Anna brings new meaning to the traditional phrase, “as a fly on the wall.” I think this book would be an excellent addition to classrooms of a younger age group, given the exceptional illustrations throughout the book and a well-developed story line. Linda introduces a lesson on early American history with a twist to make learning fun. This book has pictures throughout, making it easy to comprehend concepts. Equally important are ten non-fictional facts elementary school kids probably did not know about the journey of the Mayflower. A glossary provides additional insight into the story. The highlight of the book is illustrations of six flies dressed in an array of colors with unique shapes and forms. Kids will love these characters, and the questions associated with the pictures are sure to generate interesting discussions. The illustrations are outstanding. The main character is well developed and lends itself to a book series. Mayflower (Fly on the Wall Series) by Linda Smigaj is an educational children's story about the adventure of the Mayflower. But this isn't just any history lesson. This story is narrated by Anna, a cheese fly, who has stowed away aboard the Mayflower. Because of this unique and fresh approach, children can read the story of the pilgrims and the Mayflower from a different point of view in the hopes that they are encouraged to learn about the story. The story starts on board the Speedwell, a ship that turned out to need too many repairs. After switching to the Mayflower, the story follows the adventure across the ocean, documenting everything that happened along the way until the day the Mayflower reached the New World. Although this may be a familiar story to some, this new and educational perspective makes it a fun and interesting way to revisit a familiar story. 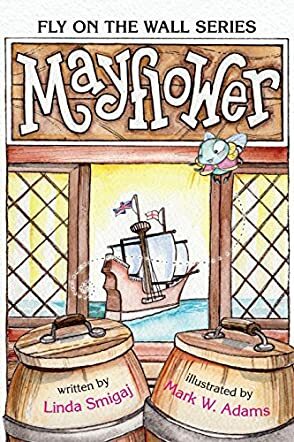 Linda Smigaj does a nice job in Mayflower with an interesting narrator character and fun, colorful drawings and depictions that are both appealing and informative. Overall, this is a very educational piece that is as fun as it is informative and I think kids will absolutely love it!